Protea Banks is situated 7.5km out to sea from Shelly Beach. The reef lies at a depth of between 27 and 40 meters. It is about 6km long and 800m wide. Essentially a fossilised sandbank which comes up from 60m. 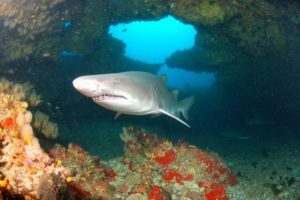 Northern Pinnacle: The reef is virtually untouched and has two caves which are used by the Ragged-tooth Sharks on their annual migration and congregation route. 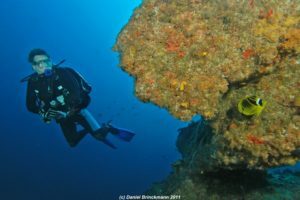 During this exciting period divers can encounter over a hundred Raggies at a time!!! (often even more). Southern Pinnacle: The Zambezi is of cause synonymouse with Protea Banks, and is a frequent visitor on the Southern Pinnacle. 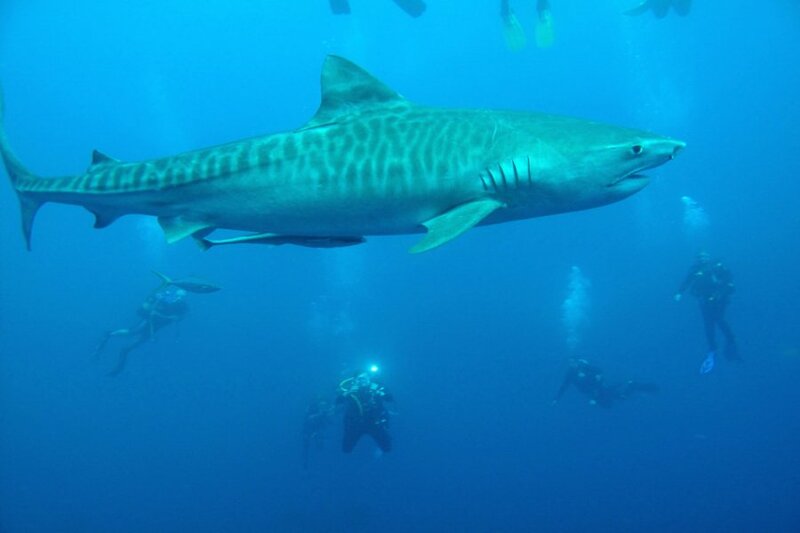 Tiger Sharks, Blacktips, Duskies and Bronze Whalers can also be seen. Large schools of Scalloped Hammerheads frequent this area. 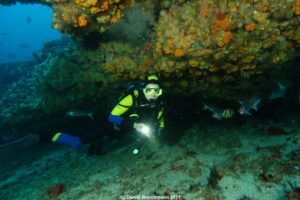 On the Southern Pinnacle there are different areas to dive. Southern Cave, which hosts all kinds of game fish. Kingfish Gully, an overhanging rock which is home to large shoals of Kingfish, Yellowtail and Potato Bass, to name a few. Protea Banks is one of the richest Tuna grounds in the world which explains why it is so strongly frequented by Zambezi ( = Bull ) Sharks. Almost all year round they patrol the reef in search of food. 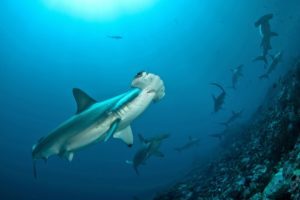 Scalloped Hammerheads swim up and down the reef in schools that at times are often hundereds strong, sometimes thousands of animals just keep coming. What a sight when you see their silhouettes against the rays of the sun !!! Although generally shy the Great Hammerhead also makes an appearance from time to time. Behind a massive school of Barracudas you could see five or six Blacktip Sharks darting in and out of your vision. These beautiful marked and steam lined animals always seem to be playing hide and seek with the divers and they behave just like underwater puppies. When the slow but steady current takes you past Sand Shark Gulley, you will encounter a sandy patch the size of a rugby field, here you can at times see as many as 60 Giant Guitar Sharks. 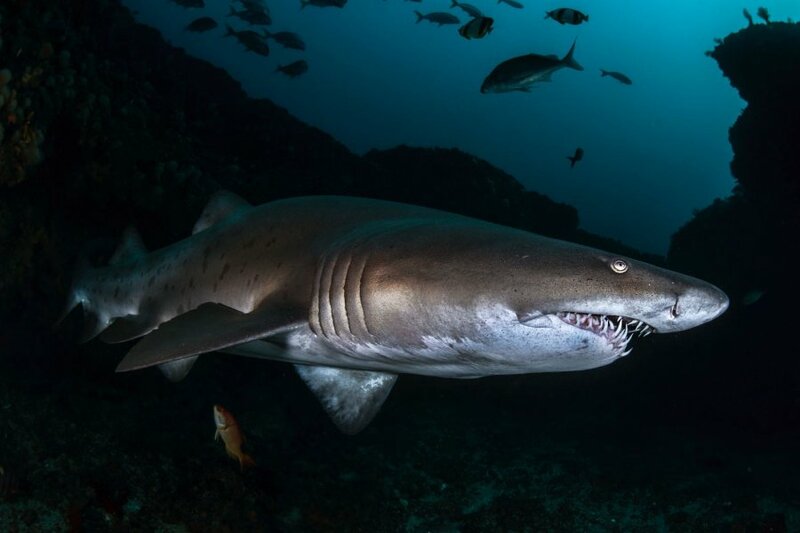 The Raggedtooth Sharks (fondly called Raggies) can also be seen in large numbers of plus minus 100 to 200 at a time during their breeding season in and around the caves on the Northern Pinnacle. Their friendly and inquisitive nature has made them a firm favourite with many divers. 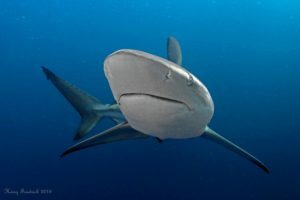 And topping the list is the magnificent Tiger Shark. This perfectly built and beautifully striped creature often makes an impressive appearance on Protea. Protea Banks is ranked as one of the worlds best Shark dives. 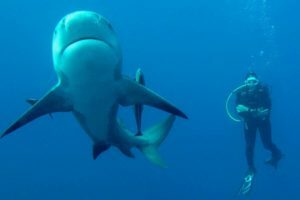 If Sharks are what you are looking for then this is the dive for you!!! !